When you're stuck in the woods (hey, it could happen…), you have to make do with what you have on hand. If you forgot to bring along your trusty camping stove, you'll have to find a different way to cook up your midday meal. Making one of those classic campfires, the kind you told ghost stories around when you were a Boy Scout, may be a bit unnecessary in terms of the time, work, and materials involved, especially when all you want to do is heat up that can of chili. Good thing you know how to make a Swedish Fire Torch! 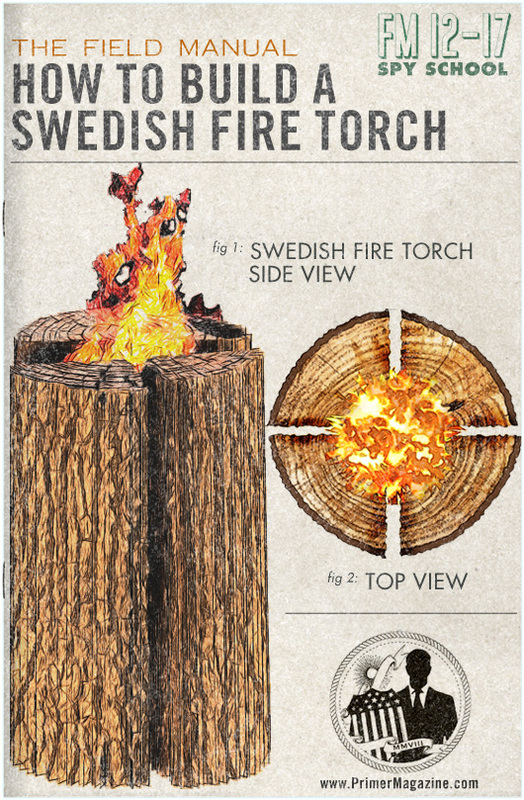 A Swedish Fire Torch is a type of campfire, but since it only takes one log to make, you won't need to stray too far from your tent to get all the supplies you need. Also, let's say you're in the woods because you're on the run. (It's okay. We don't judge.) Well, a Swedish Fire Torch may be perfect for you since it emits minimal light, smoke, and sound. If your goal is to warm multiple bodies, this won't be your fire of choice. However, this is a great one to add to your survivalist book of tricks. Nice. More posts like these PLEASE! Informative and useful. More like this one would be brain food. There are plenty of fallen trees, stumps, etc. that you could find and use in a survival scenario. That’s totally cool! Thanks for posting!